With the Häfele app you can view catalogues and brochures from Häfele on your iPad, Android tablet or Android smartphone. You can also conveniently browse for fittings and also order them directly. The Häfele iPad app is available for your iPad in the App Store. A version for the iPhone is not yet available. 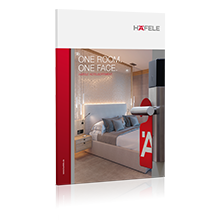 With Häfele Connect you can use your smartphone/iPhone or tablet/iPad to control all components of the Loox LED lighting system and many other functional fittings in your Smart Home that are controllable via Bluetooth through Connect BLE boxes. The Häfele Connect app offers extensive control options, including the control of electric fittings in furniture and rooms.